The first official poster or Harry Potter and the Deathly Hallows has been released and it looks amazing. 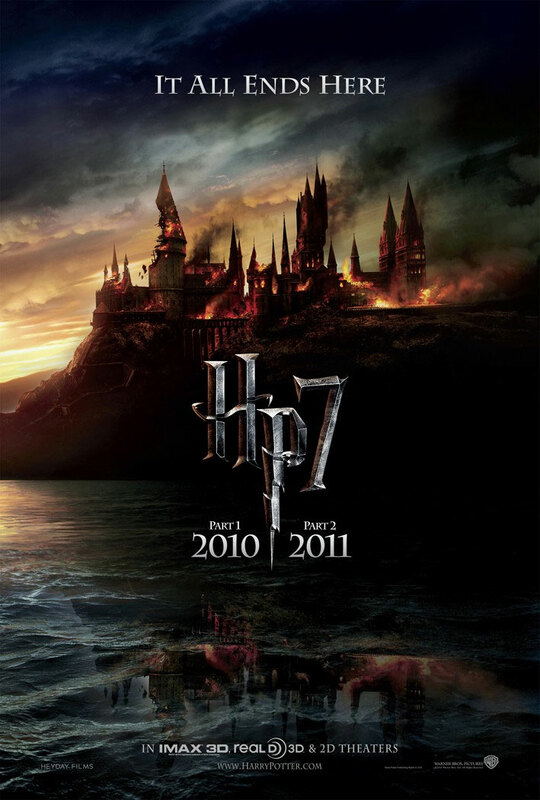 It shows a burning Hogwarts, and looks as though it has been designed to echo the poster for Harry Potter and the Philosopher's Stone, released way back in 2001! You can see the comparison here, courtesy of Mugglenet, but the actual poster is below! Also, Warner Bros. have release the actual picture (no logo) and it is perfect for wallpapers on your desktop, which can be found here. But the tagline - "It All Ends Here" - makes me feel a little sad. I started reading the books not long after Goblet of Fire (the book) was released and have been a big fan of them since. I even went to bookstores at midnight to get the last two books, and was devastated when the series ended, and I have thoroughly enjoyed the films (although Half-Blood Prince was not as good as it should of been), and so will be sad to see the entire franchise come to an end. Excited to see how they adapt the book though. The trailer is still giving me chills. I love it! But the tagline makes me sad.